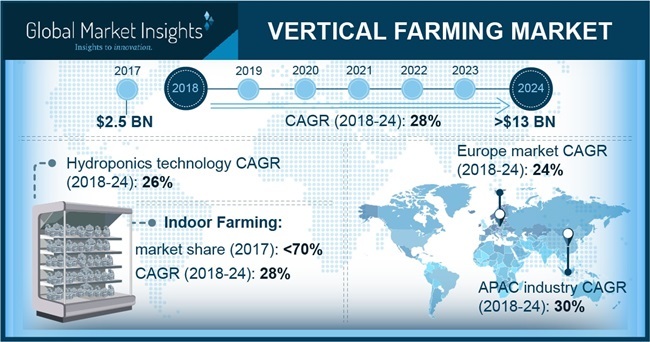 Vertical Farming Market size will surpass USD 13 billion by 2024; according to a new research report by Global Market Insights, Inc.
Increasing population rate along with upsurge in food demand will significantly drive the vertical farming market by 2024. Vertical farming is an advanced method and offers numerous benefits over traditional technique such as low dependency on the soil fertility, manpower and less usage of agrochemicals, water, etc. Growing need of food security owing to reduction in arable land across the world will boost the entire industry demand by 2024. Food security relies on availability, access, stability & utilization and this can be achieved through vertical farming technique. In near future around 90% of crop production is anticipated to come from higher yields and rest of the share will come from farmland expansion. With the technological advancements, vertical farming can be done in retail centers in coming years which will further reduces the transportation cost & time and also minimalize the chances of spoilage. The aforementioned trends will act as drives and augment the vertical farming market growth by 2024. According to United States Department of Agriculture, in 2007 farmland in the U.S. reduces from 922 million acres to 915 million acres in 2012. Increasing climatic changes and suboptimal nature of geological and meteorological events such as floods, draughts, hailstorms, tornadoes effect crop yields. This will result in adoption of innovative method of farming such as vertical farming where optimum utilization of faming space and negligible effect of climatic conditions on crop yields are observed. Such trends will bolster vertical farming market growth in coming years. Based on product, the vertical farming market is segmented into aquatic species, equipment, fruits, vegetables & herbs. Equipment segment includes atmosphere controllers, led grow lights, irrigation systems & pipes. This segment will show a 33% CAGR from 2018 to 2024 as these will help to monitor the farm atmosphere, help crop growth and control the amount of nutrients in solutions. Based on technology, the vertical farming market is categorized into hydroponics, aeroponic and aquaponics. Hydroponics segment will show a CAGR of around 26% over the forecast timeframe. Aquaponics is also a popular segment as it involves rearing of fishes and using the waste water from the fish tanks to irrigate the crops for harvesting. Adoption of this technology is limited in industry due to higher maintenance and operational costs of vertical farms using this technology. However, higher profit margins associated with this technology will increase its demand during the forecast years. On application basis there are two types of vertical farming market, namely indoor and outdoor vertical farms. Indoor farms show the growth rate of 28% over the forecast time spell. Indoor farming is extensively practiced controlled environment agriculture (CEA), warehouses and parking. This method plays an important role in satisfying the rising food demand due to increasing population and scarce land under cultivation. Indoor vertical farming helps consume lesser water and gives out more harvest than the traditional farming practiced otherwise. Irrespective of sudden climatic changes, indoor farming helps produce feed in higher quantity without crop damage. Asia Pacific shows the highest growth rate of about 30% in vertical farming market from 2018 to 2024. The product market has been popular in southeast Asia for the regional difficulties such as land scarcity and high food imports. According to a report by the United Nations, Department of Economic and Social Affairs, the number of cities with 500,000 inhabitants or more is expected to grow by 30% in Asia by 2030. Rising urbanization and the population feeding requirements in countries like India, South Korea, Taiwan and others will propel the Asia-Pacific vertical farming market over the forecast period. The key players in the vertical farming market are American Hydroponics, Sky Greens, General Hydroponics, Green Spirits Farms, Plantagon International, Urban Crop Solutions, Mirai, Spread, etc. Most of the vertical farming companies are doing contracts with such as Illumitex, Inc., Everlight Electronics., Koninklijke Philips for the lightning systems.